Entrance Door Painting | Weymouth College Dorset. All sorts of organisations call on Vanda Coatings to re-paint all the architectural metalwork on the whole exterior and interior of their premises. Sometimes however, only specific metal parts of a property need a re-spray. In this instance, Vanda Coatings successfully carried out entrance door painting in Weymouth College in Southern England. 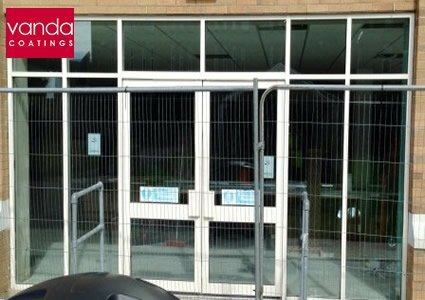 In particular, Vanda Coatings were required to re-coat a double set of automatic doors and some window frames (both externally and internally). Originally, this architectural metalwork was blue and white (as shown in the bottom right photo) and our team transformed them by painting them a clean white (top photo). There are many advantages in refurbishing a building. A renovation can give premises a new lease of life without the expense of total replacement. Restoring metal on a property not only improves its appearance it will make it last longer thus reducing the need for buying new. Window frames and doors are expensive, so the choice to refurbish a building is a much cheaper option and the results are as good as brand-new. Weymouth College offer a wide range of apprenticeships and vocational educational courses on the South coast of England and as with any service the appearance of its building is important. What is the Method Used for Entrance Door Painting? The building refurbishment didn’t just involve entrance door and window spraying, so there were other trades on this Dorset building site. Our Vanda operatives are very experienced working alongside other people, so their work wasn’t compromised at all. Furthermore, the method used for entrance door painting is one that has been tried and tested time and time again by our permanently employed professional sprayers. The first thing that our team of 3 needed to do was to mask up surfaces near the metalwork that had to be protected from overspray. The next stage was rubbing down the metalwork itself to remove most of the old coating and to create a key that the new coating would stick to. Then the doors and window frames were washed down with cleaning agent followed by some filling in of any dents. The Vanda Coatings’ team leader was then able to spray directly on to the PPC (Previously Powder Coated) surfaces because in this instance there wasn’t any need for a primer.